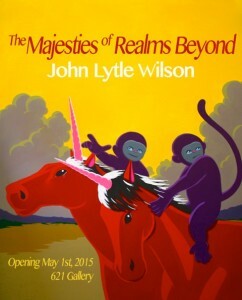 FSU Art MFA ’04 John Lytle Wilson brings “Majesties of Realms Beyond,” a collection of recent paintings, to 621 Gallery in May. The show opens Friday, May 1st and will be on view through June 28. Wilson, who lives in Birmingham, Alabama, finished his MFA at FSU in 2004, after which he served as an adjunct in the department until 2008. He is known for his vibrant acrylic paintings of monkeys, robots, and unicorns.